May 10 is National Shrimp Day. Today you have a great opportunity to cook shrimps to celebrate the holiday. According to health organizations, Americans eat shrimps about twice a week. 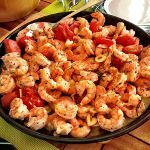 Shrimps are the most popular seafood and everyone has his or her own way of cooking it. Shrimps are great for any kind of dishes. Top 3 of America's favorites are: seafood gumbo, a stew or soup that consists of stock, shrimps and crab meat; shrimp cocktail; shrimp DeJonghe, a casserole of peeled shrimp blanketed in sherry-laced bread crumbs. If you can't afford shrimps, we can suggest you some tips, that will let you save money and enjoy your favorite dish. Buy shrimps in the shell and peel them yourself. Frozen shrimps are the most affordable and they work good for any kind of dishes. If you want to use frozen shrimps, don't forget to defrost them in the fridge on a low shelf. Let shrimps to defrost for about 24 hours, then you can cook them. Don't overcook shrimps, otherwise their meat will become rubbery and flavorless. Cook shrimps until they turn orangey-pink and the meat becomes opaque.